As 2015 draws closer to the finish line, it is time for sentimental celebratory round ups of the past year and uplifting glimpses of the future from networks and media outlets. If you are HBO there is much to celebrate as the network that boasts a delectus of award winning shows - including, the astronomically popular Game Of Thrones, among others. HBO have just released their offering to the traditional yearly round up, basking in the network's successes of the year, boasting 43 Emmy wins and offering their loyal audiences some tantalizing glimpses of the new shows and upcoming next seasons that make up their 2016 line up. A line up that of course includes the anticipated Game of Thrones season 6. Watch the video above to catch a few precious first seconds of footage from the Seven Kingdoms! Game of Thrones fans have been receiving a few early Christmas presents from HBO recently; a teaser trailer for season 6 was unveiled that used past seasons footage to hint at the upcoming story lines, and their latest season 6 poster confirmed (without confirming any details) Jon Snow's (Kit Harrington) heavily speculated appearance following his gut-wrenching season 5 finale death. These quick flash previews of season 6 do not reveal much, in the marketing style Thrones fans have come to expect - but it is enough to up the anticipation for next April when the season airs. 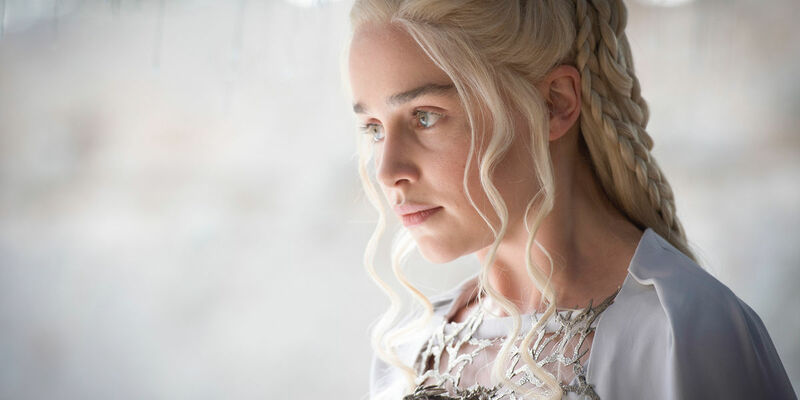 What the footage does reveal is a brief shot for four of the main characters; Daenerys (Emilia Clarke) stands alone, looking less regally polished than during her recent stint ruling Meereen, which hints towards her survival from that Dothraki horde she encountered as we last saw her (and possibly a change of location). Ramsay Bolton (Iwan Rheon) rides ahead of his men through the snow, which could confirm the Winterfell located battle fans are speculating about. Meanwhile, Cersei (Lena Headey) is shown in one of her rare moments of tenderness - reserved exclusively for her children, as she embraces Tommen (Dean-Charles Chapman). Her short hair a reminder of the impending trial expected following her brutal walk of shame. These cleverly selected snippets deliver their subtle season 6 hints whilst inserting into the overall arc of HBO's preview montage, a jigsaw edit using the device of collage dialogue to deliver the message, which is to excite our appetites for next year's many offerings. The tone of Game of Thrones does not often blend with a message of celebration, so this specific objective draws on fan anticipation rather than the detailed teasers we can hopefully expect to start trickling in from the network early next year. Despite the newness of this footage, though, more plot information can actually be gleaned from the recent Game of Thrones teaser featuring narration from the Three-Eyed Raven (Max von Sydow) and Bran (Isaac Hempstead Wright) over already viewed scenes. Still, now that fans are in unexplored territory (regarding the show's pace overtaking George R.R. Martin's source novels), any glimpses of upcoming plots are going to cause a lot of excitement, however small they may be. Game of Thrones season 6 will premiere on HBO in April 2016.